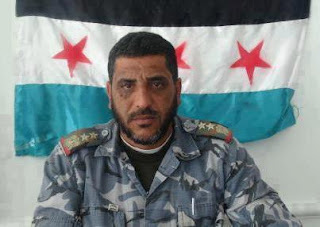 Tawhid Brigades, just one more name of Al Qaeda FSA terrorist groups, confirmed the killing of one of their top commanders Youssef Jader nick named Abu Furat who got killed by the Syrian Army during the terrorists attack against the Infantry Academy north of Aleppo. AFP reported. The terrorist Abu Furat is said to have contributed ‘effectively’ in Saladin battles as shown in the following picture ‘effectively running away’ from the confrontation with the Syrian Army.